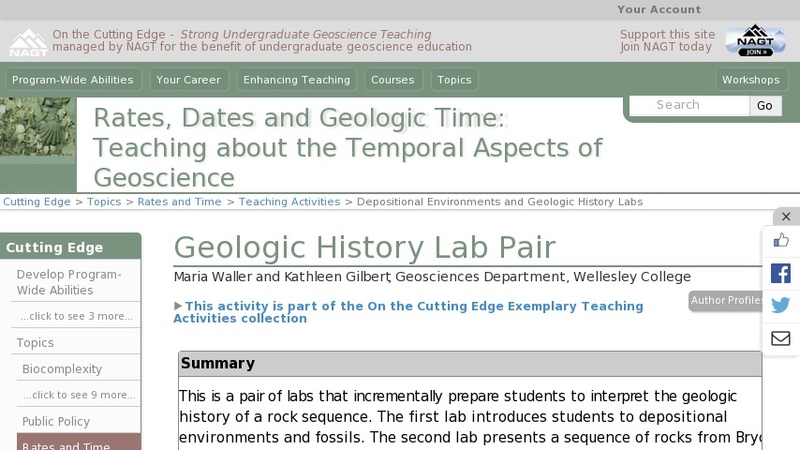 The goal of this pair of labs is for the students to learn to apply rock and fossil identification skills to determining rock formations, sedimentary depositional environments, age ranges, and, ultimately, to writing a geologic history of a sequence of rocks from Bryce, Zion, and Grand Canyons. During the first of the two labs, the students learn to make fossil and sedimentary structures identifications. They add these skills to their rock and mineral identification skills to make interpretations of the sedimentary environments along a generalized profile from terrestrial to offshore locations. During the second lab, they apply these skills to a sequence of rocks from the southwestern U.S. to interpret the environmental changes that have occurred over time. They also begin to learn how to use fossils to determine age ranges for these changing events. Once they put together all of their data, they construct a stratigraphic column and piece together a written narrative of the geologic history of the area. The students work in groups to collect their data and determine their stratigraphy. They write their geologic histories individually. The students learn how to apply their skills and knowledge to make interpretations and also learn how to support their determinations with data.